What is it about movies by Joel and Ethan Coen that makes them so immensely rewatchable? More than most other directors, they make films that really benefit from a second viewing. I have yet to find any of their films not improve for me each time I see them. One example seems to be their cult hit The Big Lebowski. The first time I saw it, it was just a pretty funny movie with a weird story. Nowadays, I’d call it one of my favorite comedies ever. I know I’m not alone here; many time I’ve heard people online and in real life mention how they didn’t quite get it the first time, only to be howling with laughter when they revisited it. Somewhere in the middle of that last paragraph is what might be the key: “weird story”. That’s something that tends to run through most of the Coens’ filmography. Not weird in terms of what they’re about necessarily, but in the way they progress. When I watch a film, the first time I see it I will generally focus most of my attention on the plot. I want to see what’s going to happen next. When things don’t turn out as expected, I get thrown for a loop. This isn’t always a bad thing, of course. Many films work precisely because they defy conventions. Others might just leave me scratching my head a bit, and the Coens can easily fall into that latter category. But then I rewatch the film at a later date, remember the odd thing that’s going to happen, and can focus on everything that leads up to it and understand why they chose to make it this way. It also frees up more energy that can be devoted to appreciating the other qualities of their films, such as acting, dialogue, cinematography and so on. I first saw No Country for Old Men back when it was new. It was early on in my cinematic awakening. It would be easy to say that I wasn’t quite ready for it at that point in my evolution as a film lover – after all, it’s hardly what you would call a crowd-pleaser – but the fact is that I did like it. Yeah, it was a bit dry and the way the story plays out is certainly “weird”, but I enjoyed the mood of the film. Plus, calm-but-psycho hitman Anton Chigurh (Javier Bardem) is the kind of character that seizes your attention at an instinctive gut-level. One does not need to have attented film school to be awed by his presence. As expected, I liked the film even better after this rewatch. Part of its appeal lies in the way it bucks against the way thrillers are supposed to go. “There are no clean getaways” says the DVD cover – last year’s critical darling Drive borrowed that same tagline, but it’s more appropriate here. The premise is (as always) simple; Moss (Josh Brolin) is a normal Texan who comes across the aftermath of a shootout over a drug deal. He finds a bag full of money and decides to keep it for himself. Then bad guys want the money back and sicks a hired gun – Chigurh – after him. And there’s also an aging sheriff (Tommy Lee Jones) who’s dismayed at all the needless violence and wants an end to it. In a normal film, we’d expect Chigurh to die at the end, possibly through Sheriff Bell sacrificing himself. Moss would survive, and maybe even get to keep the money he found. What happens is the opposite; Bell retires, having changed nothing. Chigurh gets away, free to continue on his path of destruction. And Moss is killed. We don’t even get to see that happen. Why does it have to play out this way? The film is based on the Cormac McCarthy novel of the same name. I haven’t read it, but I understand it’s a pretty faithful adaptation. Thus, it wasn’t the Coens’ idea for things to turn out the way they do. By having the bad guy win, the story transforms from your typical suspense plot into something else. Moss is presented as the protagonist for most of the film, and we’re naturally inclined to cheer for him; he seems like a decent man who, yes, took something that wasn’t his, but doesn’t seem inclined to harm anybody. But then he dies, and by having it occur off-screen, we’re harshly told that he wasn’t that important after all. The real protagonist is Sheriff Bell, and his story isn’t really about protecting Moss or catching Chigurh. Hell, you might ask if he even has a story at all. I would say it’s about him realizing or coming to terms with the way the world operates now, with bad men doing as they please and justice not always prevailing. But he already knows this when the film begins, and he hasn’t really come to terms or accepted anything as the film closes. He has merely given up. It’s this world that the Coens transport us to. It’s Texas in the year 1980, and while the story feels more film noir, the environments can certainly remind you of westerns. It’s bleak, though. Very bleak. The days are dry and lifeless, the nights cold and threatening. Roger Deakins is responsible for the cinematography, as usual for the Coens; this was the ninth collaboration between the directors and the cinematographer. No Country for Old Men is a great-looking movie. The indoors scenes in particular are striking, with dark hotel room with mere streaks of light illuminating the people within. As the film is largely without score, the visual aspects really stand out and manage to set the atmosphere for it all. It can be said of some films that the environment itself becomes a character. This is definitely one of those films. Acting-wise, there are no weak links to be found. Brolin puts in one of his finer performances. At first, Moss seems like an easy role to play. He’s a man of few words. Quiet. Stoic. As the pressure keeps building on him, we see how it starts taking its toll on him. The Moss who shambles across the border to Mexico is not the same as the Moss who’s calmly out hunting in the wilderness at the start of the film. Tommy Lee Jones is also great as the weary man of the law. You can really feel the tiredness seeping through his very being. Other prominent characters include Moss’ wife Carla Jean (Kelly Macdonald) and cocky bounty hunter Wells (Woody Harrelson), both with important scenes that the actors pull off flawlessly. And then there’s Anton Chigurh. What a fascinating creation that character is. In the eyes of most people populating the film, he’s a psychopathic hitman with an uncanny skill at carrying out his job. We, the viewers, get to see further complexities in him. He seems to adhere to some kind of moral code, although it’s hard to say what exactly it’s about. He kills some people because he’s being paid to do it. He kills some in self-defense. In some cases, he lets the flip of a coin determine whether they live or die. What are we to make of this? He would seem a Joker-esque agent of chaos, but the coin-flipping means he lets fate decide at times. There are also hints of Arnold Schwarzenegger‘s Terminator in his relentlessness – the scene where he tends to his wounds gives further vibes in that direction. 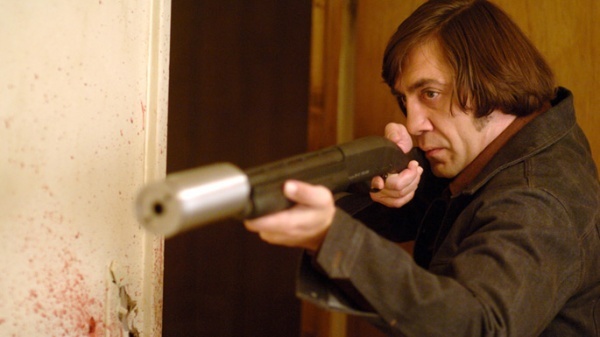 But Chigurh is no Terminator. He can be harmed by conventional means, for one. Furthermore, he’s certainly no single-minded machine. His coin-flipping might imply that he doesn’t want to take responsibility for his actions – it was the coin that declared the person should die, not him. Notice how he doesn’t flip coins when it comes to A: his paid-for targets, and B: people who gets in the way of his targets. When he’s the one who decides to kill, he doesn’t want to make the final decision. He answers to a higher call, even if it’s just in his own head. His demeanor is that of calm and rationality. His appearance should in theory not be threatening; after all, that haircut looks more dorky than anything. But yet he comes off as strange and alien. What ever else he may be, Chigurh is most certainly terrifying. Javier Bardem pulls off a masterful performance here. One last note on good ol’ Anton. There is a peculiar scene towards the end of the film. Chigurh is done with his mission and is driving along, only to get into a car accident. His arm is injured badly. Two boys come across him, and he buys the shirt one of them is wearing to use as a make-shift sling. Then he walks off, and that’s the last we see of him. It’s a strange bit to end the character’s story on, so there have been a number of theories about what it means. Some say it’s to show that even a ruthless killer like him is vulnerable. Others take it to mean that even an agent of chaos like Chigurh is succeptible to the same chaos he creates. To me, the scene serves two purposes. 1: “There are no clean getaways.” This rule applies to everyone. 2: Despite it not being clean, he does get away. He has taken damage, but he lives on. And as he keeps moving, he’ll be able to find people who don’t know his reputation, who are willing to help him. He will continue on his path. The bad guy has won. 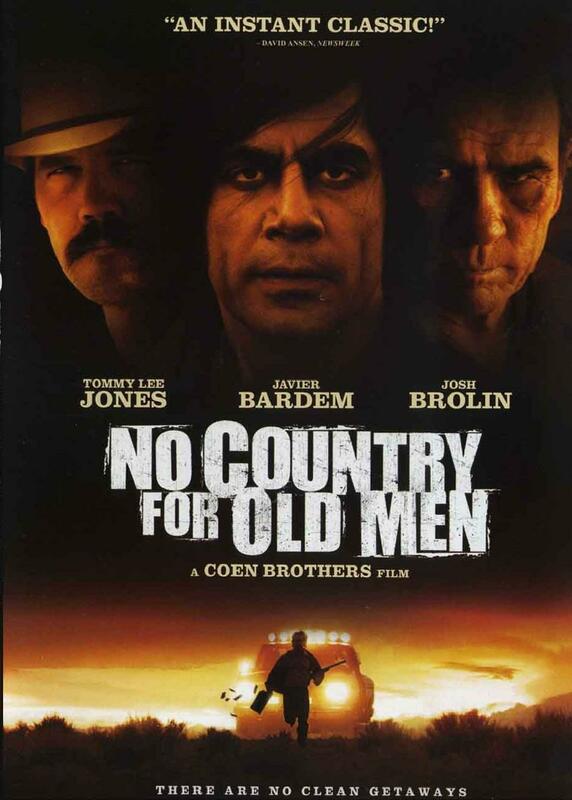 I gave No Country for Old Men a score of 3/5 when I first saw it. I’m bumping it up a notch now. I was taken aback by the weird turns the story took when I first saw it, and I wasn’t quite ready for this kind of bleak atmosphere at that point in my cinematic development. I’m better suited for it now. In terms of generating suspense and a sense of dread, the film makes no mistakes, and the story is fascinating in the way it plays out. You have to admire the audacity to take a story in these directions. I won’t pretend to fully understand every choice made, but I do enjoy mulling them over. Having acting of this caliber on board doesn’t hurt either. All in all, No Country for Old Men is a must-see. Whether you take something valuable away from it or not is more up to you than the movie. Found this to be the best “Best Picture” winner of the past decade. I should revisit this movie soon, thanks for reminding me about it. I’m partial to Million Dollar Baby myself when it comes to BP winners of the 00s. There weren’t any that I disliked however, though I still haven’t seen A Beautiful Mind. Excellent review. I too liked the movie better with a rewatch – there is just something in Coens’s movies that you discover on repeated viewings, their scripts are so smart and filled with symbols and nuances. Also the case with Fargo which I also liked much better the second time around. Fargo is one I should really get around to revisiting one of these days. I really enjoyed it the first time around, which bodes well indeed. Thank you for the praise! While I believe There Will Be Blood should have won Best Picture over this, I will say that I think they are both absolutely perfect, flawless movies. I personally love the mindfuck ending of No Country, and the way it defies expectations. It could easily have come across as stupid, but I loved it. Though I still prefer other Coen films like Fargo and A Serious Man (and The Big Lebowski, for that matter), No Country for Old Men is still one of their best, and a more than great, damn good thriller. I did the mistake of seeing There Will Be Blood with some friends. They kind of hated it, so I found it hard to focus on it and judge it fairly. I went away from it feeling fairly underwhelmed, but I hope to give it a chance to redeem itself at some point. I don’t think it’ll grow to surpass No Country for Old Men in my eyes though. Personally, I’d have voted for Juno for Best Picture that year out of the nominees. You. Are. Not. Alone. The Coen brothers make movies that simply get better with repeat viewings and yeah, I couldn’t agree more with you about The Big Lebowski – didn’t see the big deal the first time I saw it, now I can quote the whole thing verbatim. No Country for Old Men is, by far, the most faithful book-to-screen adaptation I’ve ever seen. They didn’t include everything from McCarthy’s book, but basically, what is in the movie is in the book, scene for scene, word for word. Really good review, I’d definitely give this a 5/5, but I’m glad you enjoy it nonetheless! Is the No Country for Old Men novel worth checking out? I read McCarthy’s The Road a while ago and liked it quite a bit. Been thinking about giving NCfOM a go as well. I’ve read all of his books and I think NCfOM is his best novel, second only to Blood Meridian. It is definitely worth checking out. Alright, I’ll might have to do just that, then. Great review and analysis. I saw this film a while ago and wrote about it as well. I like your take on the ending scene with Chigurh and the idea of “There are no clean getaways.” In my post I talked about how Sheriff Bell refers to Chigurh as a “ghost” on several occasions. Coupled with your analysis, we see that even “ghosts” don’t have clean getaways. I also saw Chigurh as an embodiment of death itself, and perhaps an agent of fate — made most obvious through the coin-flipping. Bardem’s cold, calm portrayal certainly helped lend credence to this idea as well. As you say, the Coen brothers and cinematographer Roger Deakins excel in making the setting and environment an additional character. That and great acting are two things that make this film so good. I’m also glad that you get a lot of value out of re-watching movies. Some people say, “What’s the point of re-watching if I already know what’s going to happen? There is no suspense anymore.” But there is so much more that can be gained from a second viewing, especially with films as intricately made as No Country for Old Men. I also wrote a post a while ago about re-watch value in films. That and my entry about No Country for Old Men are below at the end of this comment. Lastly, I guess I should watch The Big Lebowski again. I’ve seen it once and have the same feelings you did after your first viewing. The fact that you enjoyed it so much more when watching it again, coupled with its status as a huge cult hit, makes me eager to delve into it once more. I’ll probably like it more the second time. I had similar cases with the movies Drive, Se7en, and Requiem for a Dream, the latter two of which are probably in my personal Top 5 all-time (unofficially). Anyway, great analysis. I enjoyed reading it and seeing some of the same things I thought as well as some new, interesting ideas. Thank you for the kind words! I’m glad you enjoyed the post. I don’t tend to dig into a movie like this in my writing as often as I perhaps, so it’s nice to see that people enjoy it when it does happen. The whole fate vs chance thing is seemingly a key aspect of Chigurh’s being, and just like how people have debated that struggle in a grander scheme for all eternity, it’s a constant tug-of-war within Chigurh as well. Coin-flipping is representing fate here, but then the need for the coin-flipping is solely determined by Chigurh. There is seemingly no reason for him to put the “test” on the gas station attendant. It’s as though he does it purely on a whim, maybe because he’s displeased with the man due to their conversation somehow. This would then signify chaos; life or death, the situation wouldn’t have happened if Chigurh hadn’t made it happen. It was his decision. His free will (chaos) necessitated the coin (fate). Though if one looks beyond the coin-flipping, it does seem as though fate is the stronger influence on Chigurh. Perhaps it is as you say; he is simply death. Not in the classical “Grim Reaper watching a person’s hourglass to see when their life is over” kind of way, but in a different sense. Moss is seeking to go above his station, “tampering with dark forces” by stealing money from criminals. Death is his punishment for this. Others are killed when they get in the way of Chigurh’s pursue of Moss; they’re punished for trying to prevent him from carrying out his ordained mission. Then there’s the curious case of Carla Jean, who is punished not for any fault of her own. Chigurh proposes a bargaining with Moss that would spare her life. Moss doesn’t take the bait. This is interesting since it goes against the typical “making a deal with Death” scenario, in which a mortal proposes a game with the Grim Reaper to save his own life. Here, Death offers the deal. Chigurh puts the pressure on Moss, offering not to spare his life but at least that of his wife. Why would he do this if he’s an agent of fate? There’s no reason for Carle Jean to die, other than the fact that Chigurh wills it so (chaos). Had Moss not stolen the money in the first place, would Death still have come for her? Why? A lot of fascinating things to think about in this film. Rewatching movies is something I’m quite fond of. I tend to do it with most types of movies, for different reasons. Some for more purely cinematic reasons (which you mentioned in your post on it): to take in the film-making aspects of it and appreciate it on that level. Others for the entertainment value that still lives on, such as in action films and comedies and so. And then there are those movies I watch out of curiosity to see whether my taste has evolved or changed in some way since the first time. I watched Chaplin’s The Gold Rush some time ago, which was my first ever silent comedy. I liked it, but lacked the context to properly evaluate it since I hadn’t seen anything else quite like it before. As I further explore that era and genre of movies, it seems likely that I’ll have a different kind of reaction to it (for better or worse). And yes, The Big Lebowski is well worth revisiting. It’s certainly not as deep as No Country for Old Men, but there are some interesting aspects of it – such as its sense fo nostalgia and throwback to older detective films – that shine through better on a rewatch. Plus, it’s just a really funny movie. Again, thank you for commenting. I had a look at the posts you linked to in your comment, and I’m sure I’ll spend some more time on your blog. I’m liking your writing so far. Thank you, as well, for your kind words. I’ll be visiting your blog frequently as well. and actually excellent material for visitors.